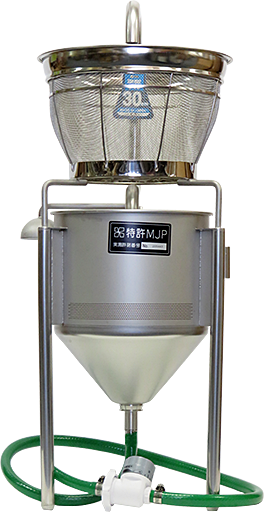 The MJP Rice Washer is a commercial use rice washer that uses water power to clean up to 5-7.5kg (50cups; Japanese measurement) of rice in a matter of minutes. It has a proprietary design that enables it to thoroughly clean each grain of rice from all the dirt and grime that is left on its outer shell after processing. 1) Enhance the flavor of rice-the	system is designed to immediately discard contaminated wash water. When washing rice, mucus is left in the wash water. This mucus, or "nuka" in Japanese, tends to be reabsorbed as the rice is rinsed in the wash water. This system discards this nuka before it has a chance to be reabsorbed, leaving the flavor of rice untarnished, resulting in more richer, flavorful rice when cooked. 2) Save water-The washing cycle uses only 3-5 times the volume of water equal to the rice being washed. 4) Save electricity-The system only uses water pressure-no electricity is required. 5) Minimal operating requirements-Basic assemblyrequires hook-up to a hose with an output of at least 40psi in al location where water may be easily drained. During operation, the user is required to switch the unit from washing to finish mode. A 5kg (11lbs) of rice can be washed, literally, in a matter of minutes. *Price includes one year limited warranty. Tax applies only to purchasers within the states of CA and IL. *For more information, please contact us. This unit is easily adaptable to most commercial sink.